so i got these for EDC las vegas this year and absolutely loved them. they didn’t make it home with me, but hey, it was EDC and it was awesome while it lasted. Definitely a great pair of glasses. Arrived quickly and included a few free paper ones as well. I purchased a pair of these for my son for his birthday. He absolutely loves them to watch tv shows with. Great purchase! Awesome glasses. Quality of lenses much better then the disposable paper ones. The lens is still a little foggy, but the glasses must have tiny grooves in them to refract the light properly, so it’s expected. Wore them to Ultra 2015, and shared them with people around me, everyone loved them! Let me start by saying I am a GloFX promoter, but that does not influence this review. 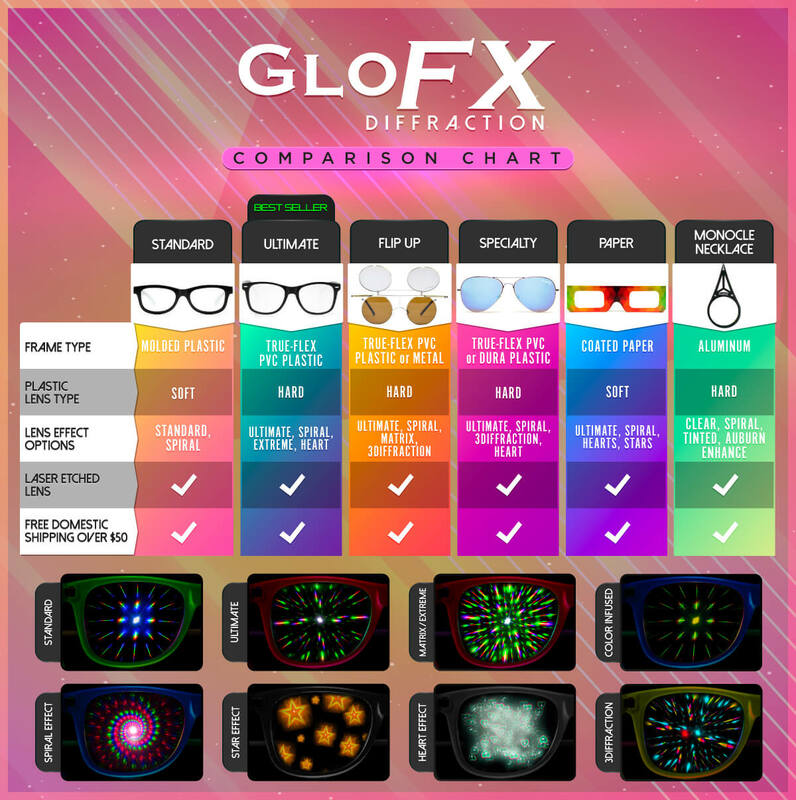 I LOVE diffraction glasses, after experiencing them for the first time I bought several pairs from different brands and The GloFX Ultimate’s were the best hands down. In fact, that coupled with GloFX’s unparalleled support is why I chose to become a promoter in the first place. Since, I’ve been handing out diffraction glasses to litterally hundreds of people. All of which are blown away by the Ultimate Diffraction glasses. These glasses are super tough, I dropped mine while seeing Excision in Nashville, they survived being stepped and jumped on by several people. If that doesn’t break them, I’m not sure what will. The diffraction effect is not only very intense, but the lenses are much clearer than other brands as well. If you’re looking for a pair of diffraction glasses to make raves more enjoyable, you’ve found the right pair. In love with these diffraction glasses. Bright colors, tough frame. Your friends will love them. Went with these after getting a few of the paper pairs for free with my last order from Glofx. Much nicer frame, more comfortable and high quality. The lens is a big foggy, but I think that is just how all diffraction glasses are. Great products and I had to get some extra help on the phone. They were so helpful, threw in something extra. Quality service and products. There is a reason these guys are the best in the industry. I love it! The quality is great and fits just right I didn’t expect to get anything else but they included some goodies like two paper glo fx glasses and a glo wristband. Highly satisfied with the product and shippment. I adore these glasses! they are super great and intensify the rave experience!! Awesome!! Super durable and stylish. Got them in 1 day and I’m absolutely in love!! Can’t wait for festival season.